Including chlorine, fluoride, pharmaceutical drugs, metals (mercury, bromide, lead, arsenic), chemicals, bacteria and more. 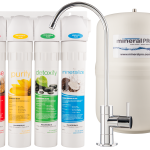 Water filter systems remove these minerals from the water; therefore, re-mineralization is required to ensure the naturally occurring minerals are present. Drinking de-mineralized water can actually leach minerals from bones and teeth. 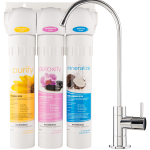 Ensures optimal health, water filter systems and contaminants typically leave the water acidic. Great tasting water is fundamental to ensure proper hydration – when water does not taste good alternative beverages are typically selected. Ensure that water is clean. The 1st step for healthy water is to ensure the water is clean which involves removing the toxic and harmful contaminants that are present in the water. Multi-stage filtering is required to ensure all the possible contaminants are removed. The 2nd step for healthy water is to replenish the natural minerals in the water. The levels of natural minerals are reduced in water due to the the piping and distribution process, from exposure to contamination, and from the water being taken away from natural mineral sources in rivers and streams. Drinking water with higher amounts of minerals results in lower heart disease and cancer mortality rates. The 3rd step for healthy water is to ensure the pH is balanced to a healthy alkaline level. Healthy alkaline pH level for drinking water is between 7.5 and 9.5. Several research studies have demonstrated the presence of chemical carcinogens in surface, ground water, and municipal treated drinking water. However, often overlooked are the beneficial properties in drinking water that can help protect us from diseases such as cancers – natural minerals and alkaline pH. Water that contains natural minerals and alkaline pH is associated with lower mortality from heart disease and cancer, and overall health. The drinking water in the 100 largest cities in the US were found to have 10% to 25% reduction in the amount of cancer deaths when the drinking water had a moderately high level of minerals and had an alkaline pH (above 7.0). The 4th step for healthy water is to ensure the water has a great natural spring water taste. So if you want to have the peace of mind of knowing the water you drink is the best water possible for your health, give us a call at 1-855-586-6667 and we will be pleased to help you select the right healthy water system for your health needs.